A restaurant menu is more than just a list of food with prices. It's a reflection of a restaurant's style and concept. As such, it's an important marketing tool and each element of its design should be carefully considered. A good rule of thumb is to keep these short and simple. But the best descriptions of food are vivid and enticing enough to make a guest’s mouth water. In any case, make sure the description reveals the major ingredients in the dish. Use the proper ethnic names to add a bit of authentic flair, but don't leave your guests wondering what's in baba ghanoush. Descriptions on your menu should be interesting without being too complicated to understand. A restaurant menu design and layout should be compatible with the restaurant itself. This is a matter of your choice of font, color scheme, and illustrations. They can be formal, casual, or playful, whatever matches your restaurant concept, location or theme. If you are opening a casual Mexican restaurant, vibrant colors such as red, turquoise, purple, and green can be used. The same colors would look out of place on the menu of a French bistro or a fine Italian restaurant. A French bistro menu may have a classic script font or a simple plain one, while a sports bar might use a bolder font. In any case, beware of choosing a font or type size that is hard to read or too small. 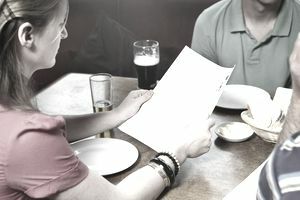 Working out your ingredient costs and portion sizes are critical to pricing each menu item correctly. Your overall business costs are important, too. The price of a salad can be very different at a fast-casual restaurant and a fine dining place, for good reasons related to costs. You also must familiarize yourself with your competition's pricing. You don't have to undercut everybody else, but you can't price too far above them, either. Certain occasions such as holidays or local festivals are a good time to put together a specialty menu. Mother’s Day is a prime example. Specialty menus and prix fixe menus allow you to expand your regular dining selection and even learn what works and what doesn't. Consumers consistently cite healthy menu options as an influence in their decisions on where to eat. Consider adding a selection of low-fat, low-calorie options, and some vegetarian if not vegan dishes. You might also offer a smaller portion size of some dishes, at smaller prices.